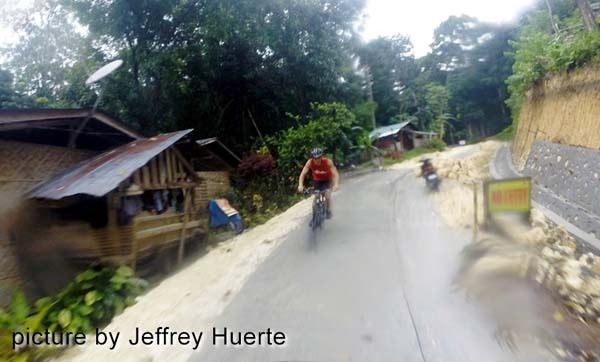 The soon-to-be-completed diversion road from Bonbon-Alegria in Loboc was a promising downhill ride. 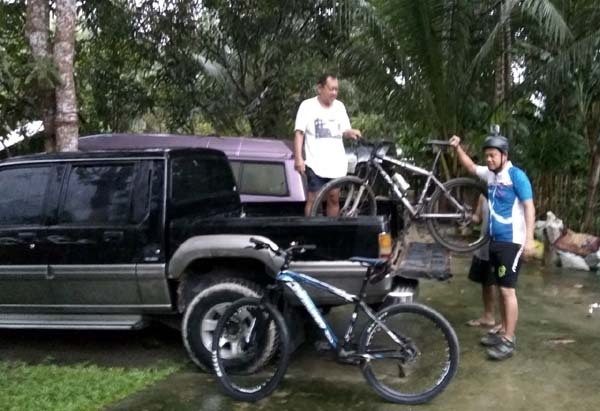 To get there, we loaded up the bikes on a truck for the 7km uphill ride. From there, we simply bomb down all the way home. But it was raining hard. 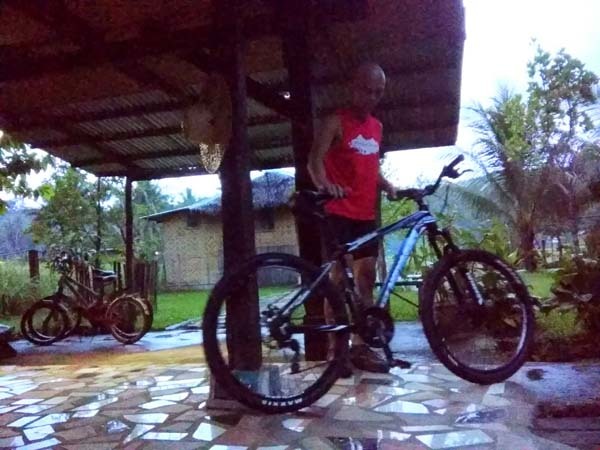 Fast downhill ride in the pouring rain? Crazy! 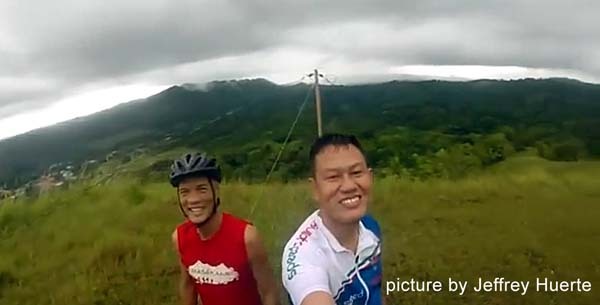 Juan, who drove the truck and an mtb rider as well, pleaded to Jeffrey to cancel the ride. I was game either way. Jeffrey said we ride. That put a smile on my face. Rock and roll sa ulan! We left our phone cameras on the truck and had to rely solely on Jeffrey's Go Pro water-proof video-cam. 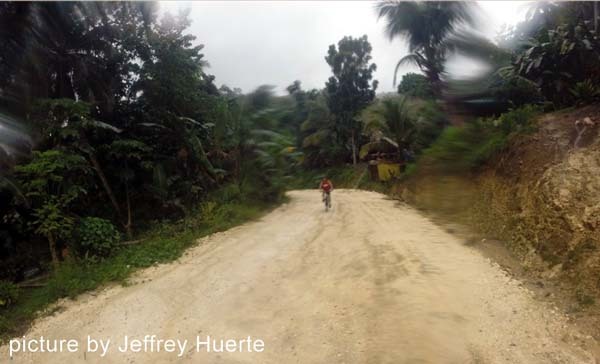 For the most part, the entire road was newly paved while some parts were still rough with graded coral rocks. The initial ride was on rolling hills with smooth ups and downs. 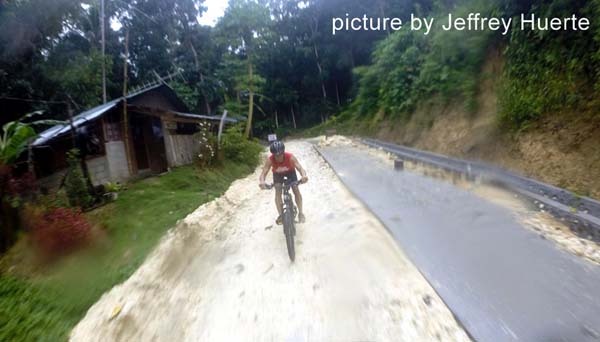 When we reached the newly paved road, the serious downhill began reprieved only by a few flat sections before a succession of more downhills. The unrelenting rain was an X-factor. It added excitement, unpredictability and challenge. Hard raindrops were hitting my eyes on the fast descent, it became hard to see. 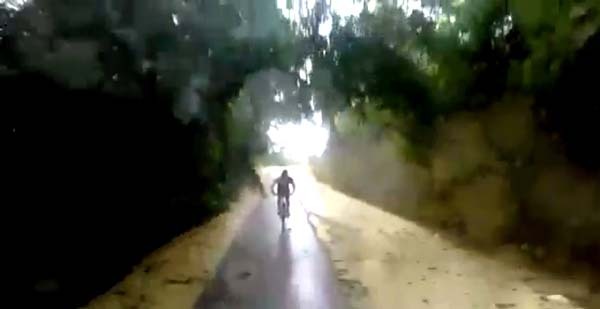 I was closely following Jeffrey to be on the frame of his back-facing Go Pro video but water kicked-up by his tires got into my eyes as well. All of these were happening at high speed. Since the road was newly paved, there wasn't moss or algae build-up so it wasn't too slippery. We stopped on a section to climb a hill on foot, leaving our bikes by a house on the road. 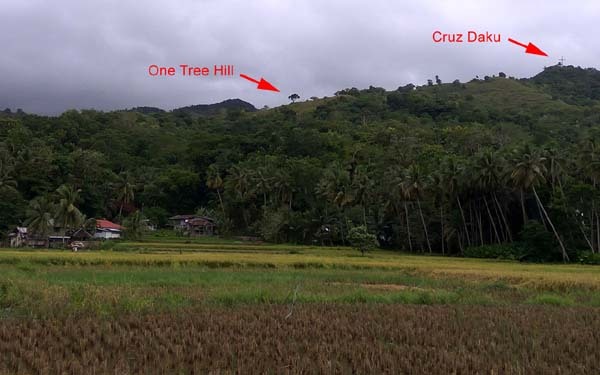 The hill is commonly called 1-Tree Hill because there is one tree that stood out within a clearing. From the top, the view was panoramic of Loboc. I didn't realize we were already close to home. I could see the town center, the cemetary, Loboc River, Cruz Daku, Guadalupe Virgin and even the far-off Balay Silangan! 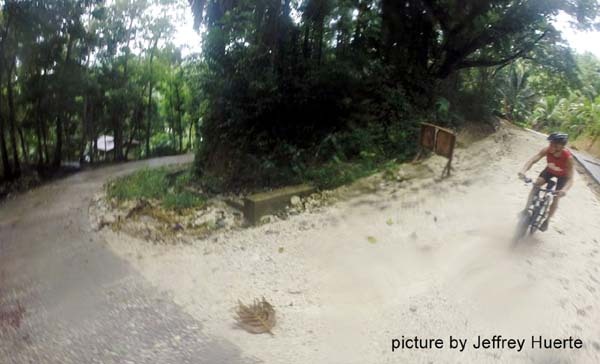 It seemed like the map of Loboc was blueprinted in front of me. It was a perfect place for a sunset chill over cold beer. After getting back to our bikes, it was a short ride back to the house. It was a wet and wild ride! What a rush. 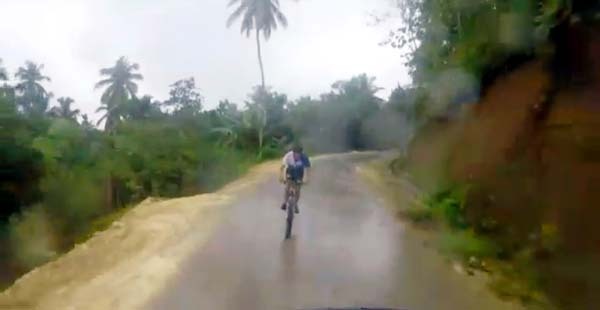 Yes, it was crazy - Juan and the locals who saw us certainly thought so, but it wasn't reckless. We still knew when to feather the brakes when it got too dicey. 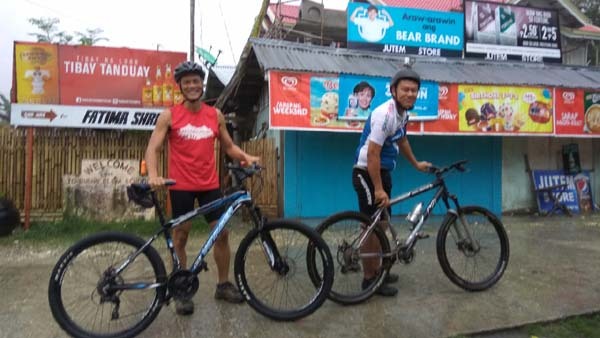 Come to think of it, Jeffrey and I practically covered a lot of ride scenarios - brutal climbs, fast downhills, scenic rides, epic rides and now this - ride in the driving rain. Whoa! Thank you Jeffrey and thank you Juan for taking us to the sweet spot.